The Republican Party of Orange County Central Committee meeting started shortly after 7 PM. After the invocation, the Pledge of Allegiance, the swearing-in of several new alternates, a resolution was brought up at 7:30 PM in memory of OCGOP Chairman Emeritus Tom Fuentes, who passed away on Friday. The Fuentes memorial resolution was adopted unanimously. Then, there were some brief remarks about the OCGOP Flag Day celebration and a description of the state of the 74th Assembly District race between Assemblyman Allan Mansoor (R-Costa Mesa) and Councilwoman Leslie Daigle (R-Newport Beach). At 7:47 PM, OCGOP Chairman Scott Baugh brought the motion to remove Villa Park Councilwoman Deborah Pauly from her post as First Vice Chair of the OCGOP. He cited Youth Associates deciding to stop participating due to their discomfort with Pauly’s criticisms of the Party. He cited Pauly’s allegations of corruption against Baugh. He said he should be removed if this is true. He stated Pauly is divisive at a time when Republicans need to be united against Democrats. He cited her use of the OCGOP First Vice Chair title as misrepresenting her as speaking for the OCGOP. He cited her “Tweets of vulgarity” as unbecoming of the First Vice Chair of the OCGOP. He cited a need for a smooth-running, unified party. Baugh then recused himself from presiding as maker of the motion. Pauly was also recused as subject of the motion. Then, 2nd Vice Chair Mary Young became presiding officer. Dean Grose was ruled out of order for attempting to refer the matter to Ethics Committee. Orange City Councilman Fred Whitaker, Pauly’s predecessor as First Vice Chair, seconded the Baugh motion. Whitaker stated Vice Chairs should not distract from the Party and its campaigns. He always saw the First Vice Chair’s role as being a “supporting actor” in the Party. At 8 PM, Young asked Parliamentarian Kermit Marsh for clarification on the motion. Marsh stated it would require an absolute majority of all members; any absent members would have their votes sought by mail, with mail ballots returned within 10 days. Marsh, who is also Ethics Committee Chair, noted he had not received an Ethics complaint against Pauly, and there was only the motion to remove at this point. Marsh stated Robert’s Rules dictated that each side in favor and against of the motion should have alternating speakers and that Pauly should be allowed to speak in her own defense without being counted in the alternating speaker sequence. At 8:07, Pauly opted to defer her remarks to the end, wanting to hear what others had to say first. At 8:09, Lynn Schott was concerned that this was the first she heard of this motion so soon after the death of Tom Fuentes. She urged to delay until after the election to avoid interfering with the supervisorial election. At 8:10, Fullerton Councilman Bruce Whitaker urged “victory through unity.” He noted the disruptions led by Gil Ferguson against Fuentes and argued Fuentes was able to deal with Ferguson and his allies without removing anyone. 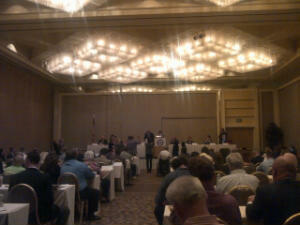 He urged the OCGOP to not take action that could interfere with the supervisorial election. At 8:12, there was an arcane parliamentary procedure discussion that concluded Baugh and Fred Whitaker were the first two speakers in favor of the removal and Schott and Bruce Whitaker were the first two speakers against removal. At 8:14, Huntington Beach Councilman Matt Harper spoke of his situation when he was YRFC Chair and had a Vice Chair from another faction, which distracted from the group’s efforts to grow the Republican Party and advance its candidates. At 8:15, Dean Grose stated there were no complaints from Youth Associates. He questioned the timing, believing it could affect the supervisorial race. He complained of the circular firing squad and the need of Republicans to battle Democrats. At 8:18, Fred Ameri spoke of being Tom Fuentes’s business partner for 17 years. He spoke of Fuentes being a man of action who sought to grow the party. He said there was too much time being spent on the distractions from Pauly. Ameri called on Pauly to resign to spare the time and controversy. At 8:22, Pauly declared this the funny season of politics. Citing Baugh’s allegations that she was misusing her title, she stated Baugh had actively campaigned and raised money for her supervisorial opponent (Todd Spitzer). She said it was his right, and there was no need to remove him (and implicitly no need to remove her). She spoke of her disgust that the Youth Associates were dragged into this, particularly since she knew of no complaints from them. She spoke of having only missed one Central Committee meeting in 5.5 years. She spoke of her concern at the shrinking of the Republican Party, as Republicans registered No Party Preference. She spoke of her time volunteering to grow the party, including registering new voters on a near-daily basis. She said it was her responsibility to represent not just the Central Committee to the public, but the public to the Central Committee. She stated Baugh was seeking to “do away with” her using the supervisorial race, as she stated he was already attempting to find a way to remove her. Pauly stated on May 31 (the day the mail ballots for her removal were due), that Spitzer would send out a hit piece about her Republican peers removing her. She questioned who would count the ballots on the vote to remove her. She said she would never leave the Republican Party, as she is a true believer in the principles of the party. She said she first ran for Central Committee to reform the corruption she saw in the party, specifically citing Mike Carona. She cited Daigle and Spitzer’s 3%@50 votes. She said Fuentes told her that the Chair and First Vice Chair should meet regularly. She said when she arranged her first meeting with Baugh, he berated her for everything she’d done wrong. Pauly stated the effort to remove her was solely to provide Spitzer with a June 1 hit piece, just before the June 5 election for Supervisor. She stated this effort to remove her should be properly noticed for the June Central Committee meeting. Pauly stated there is right and wrong, and that this is wrong. At 8:36, Baugh asked Spitzer if he would use this removal in a hit piece, and Spitzer pledged he would “not spend one red cent” on this. Baugh then stated he had been urged to bring this motion thrice before. He then stated that he would be out of the country in June, the Central Committee is dark in July, and August was election season again. He stated that’s why he brought the motion in May. He made the distinction that Spitzer did not know about the true cost of 3%@50 when he voted and now apologizes for it while Daigle knew the true cost and continues to lie about her votes. Baugh stated that there is nothing wrong with disagreement and competition, but that it is wrong to make provocative and incendiary statements that embarrass the party. He said the motion is to prevent a house divided, not divided on ideas but divided on personality. At 8:43, Matt Harper asked to extend the balloting period to June 6 to avoid interfering with the election. Marsh said the by-laws require exactly 10 days. At 8:44, Fred Whitaker asked if the 10 day period applied to those present and voting. Marsh said it only applies to physically absent people whose alternates were not present. Marsh stated Secretary Zonya Townsend and Sergeant at Arms Norm Dickinson would be responsible for counting the ballots. At 8:46, a question was asked if minutes could be provided to absent voters. It was pointed out that minutes report actions not quotes. At 8:47, Matt Harper asked if it was 10 calendar days or 10 business days. It was quickly ruled (while both sides shouted) that it was 10 calendar days. At 8:48, Pauly asked to speak to rebut Baugh. Young refused. Pauly then asked for a roll call vote. Pauly then stated she could battle Democrats’ accusations of the GOP’s war on women. She asked who would be next after her for removal. She said she has not used her OCGOP title to run for Supervisor while Spitzer had used his former Assemblyman title. Young and Pauly fought back and forth about whether Pauly was out of order, but was able to get the remarks above out. A Central Committee member shouted out calling for a roll call vote. Young rejected the proposal because the motion was made with the expectation of written ballots. At 9:14, Young asked for the remaining two voters to cast their ballots: Westminster Councilman Tyler Diep and Deborah Pauly herself. At 9:16, Young declared the balloting closed. At 9:19, Rhonda Rohrabacher spoke about precinct walking opportunities to help Allan Mansoor and using smartphone apps for precinct walking. At 9:20, US Senate candidate Greg Conlon spoke about how “vulnerable” Dianne Feinstein is and that Republicans will gain the Senate. He stated he believed that Feinstein would resign rather than be in a minority. He stated Jerry Brown would then appoint Gavin Newsom to the Senate. Conlon spoke of his previous candidacy as the Republican Nominee for State Treasurer in 2002. He stated he was sending 1,000,000 pieces of mail and has residual name ID from 2002. At 9:24, Walter H. Myers III spoke of the American Dream Outreach Committee’s efforts to attract more voters to the Republican Party. Myers spoke of the committee’s presence at the Black April commemoration in Little Saigon. Myers spoke of the committee’s presence at the Taiwanese Heritage event. Myers spoke of the committee’s presence at the Israel Expo. He credited Mark Cohen and Deborah Pauly for organizing these. Chandra Chell, Dean Grose, Craig Alexander, Emily Sanford, Cuong Cao, and a couple names I didn’t catch (sorry, readers). At 9:28, the votes were announced. Out of 71 members, 66 votes were cast. 5 will need to be mailed. 47 votes to remove, 16 votes against removing, 1 abstention. At 9:29, Pauly said she had no report but was honored to have served as First Vice Chair. At 9:30, Young reported 5,000 Republican voter registrations. At 9:32, Townsend reported Dianna Gadberry was the OCGOP Volunteer of the Month.